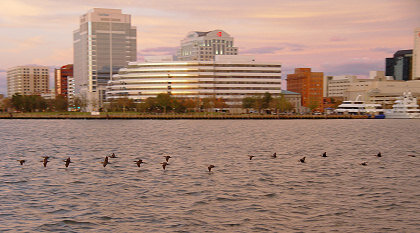 Here are more sunset pictures of the Norfolk waterfront. 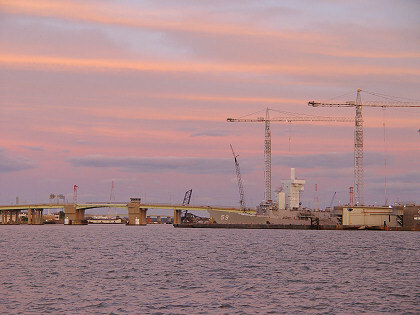 A panorama of the Norfolk waterfront and Elizabeth River, taken from Tidewater Marina in Portsmouth. Click on the picture to see a bigger version (156kb); use your browser's "back" command to return here. 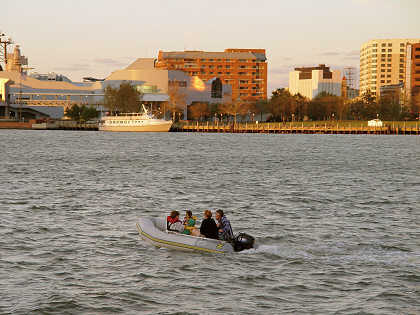 Some people cruising up the river in their dinghy, probably heading to the nearby anchorage at buoy "Red 36". A flock of cormorants flying low over the river at sunset. Click on the picture to see a bigger version; use your browser's "back" command to return here. 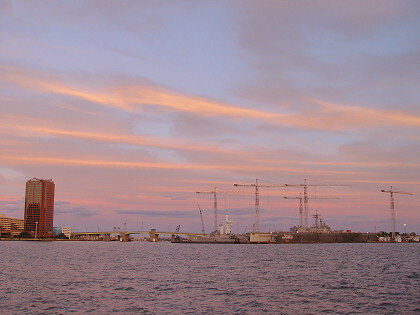 A colorful sunset over the Metro Machine shipyard and the I-264 bridge. Click on the right-hand picture to see a bigger version; use your browser's "back" command to return here.